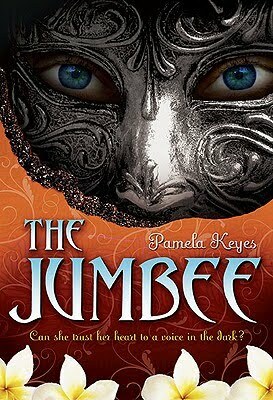 Jumbee by Pamela Keyes. (Grades 7 and up.) Dial, October 2010. 388 pages. Reviewed from ARC provided by publisher. After the death of her thespian father, Esti Legard moves to a Caribbean island to attend a prestigious theater school. She's finally free from living in her father's shadow, but a mysterious death at the theater leaves her wondering if her father haunts her still. She begins to hear a voice in the theater, a boy who calls himself Alan and coaches her on her acting. Esti's performances get better and better and she starts falling for Alan, the sweet, sensitive man whose face she's never seen. When bad boy Rafe Solomon, a childhood friend of Esti's, shows up on Cariba, Esti must choose between the boy who speaks to her heart and the boy who holds her in his arms. Jumbee is a reimagining of The Phantom of the Opera, set on a lush Caribbean island and there were many things I loved about it. When I got a pitch for this book, the thing that sold me was that it was a story inspired by Phantom. I have loved Phantom since I was in the sixth grade and my class went to go see it. I played Christine Daae when my class put on the play. I memorized the soundtrack. I just really, really loved it. So that was fun for me, to see the ways that Keyes mirrors the story of Christine, Raul, and the Phantom. I must confess that as I was reading it, I kept getting Phantom songs playing through my head. But the trick here is to compare it with Phantom but not to compare it too closely because that's not really fair to the book. Alan is no Phantom. I can really appreciate Ms. Keyes's challenge in creating a character who's ghostly enough to be mysterious but human enough to be a teen love interest. However, I'm not sure that I totally bought Esti's love for Alan OR Rafe. There was a little too much telling instead of showing, which kept the book from being really excellent. I do think the lush Caribbean scenery and the rich folklore traditions included make the book stand out. That combined with my extreme love of Phantom kept me turning the pages. I'd recommend this to teen theater buffs, maybe fans of Eyes Like Stars by Lisa Mantchev (there is a lot of Shakespeare in Jumbee, so I'd particularly consider teens who dig the Bard). Jumbee will be on shelves October 14.